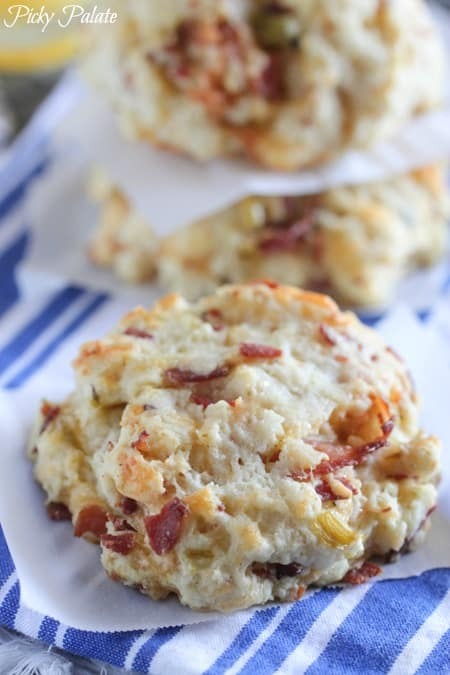 Treat yourself to my Cheesy Green Chili and Bacon Buttermilk Biscuits this week! Buttery and full of great flavors. 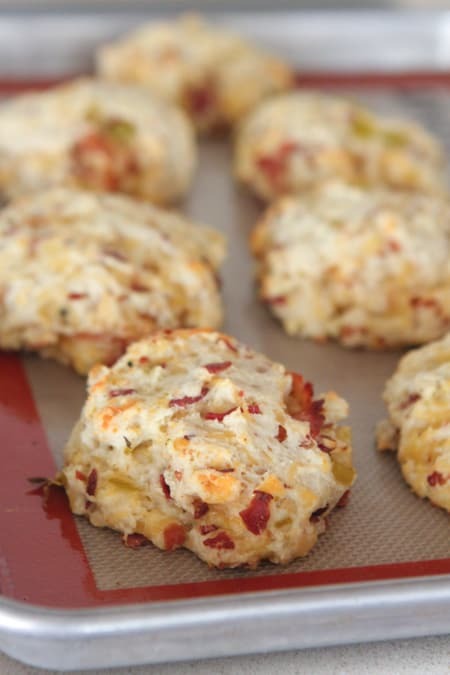 You are in for such a treat with my Cheesy Green Chili and Bacon Buttermilk Biscuits! 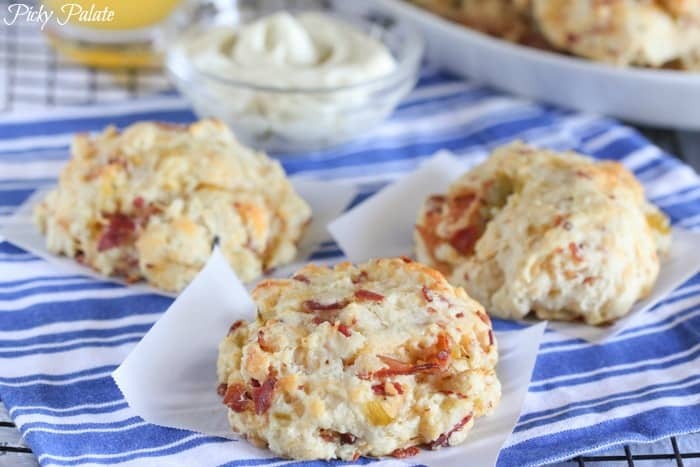 You know by now that butter is one of my very favorite ingredients 🙂 I’ve developed these Cheesy Green Chile and Bacon Buttermilk Biscuits that are packed with my favorite ingredients. 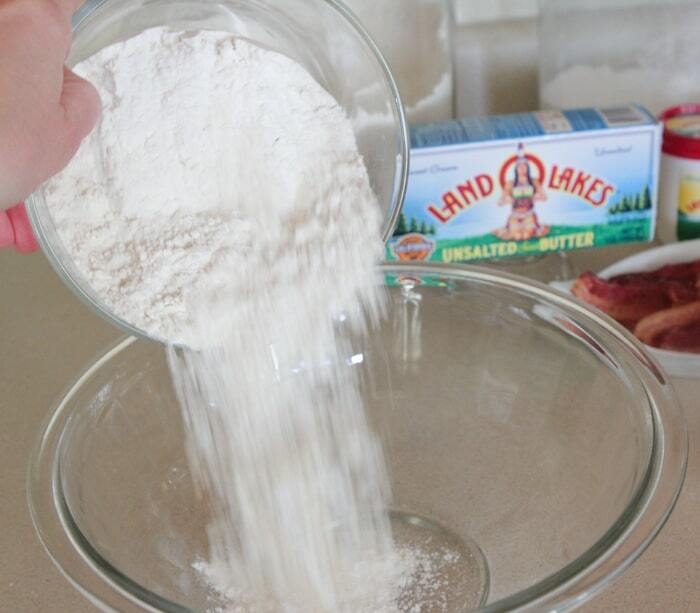 I’ve developed a buttermilk biscuit that is packed with my favorite ingredients. 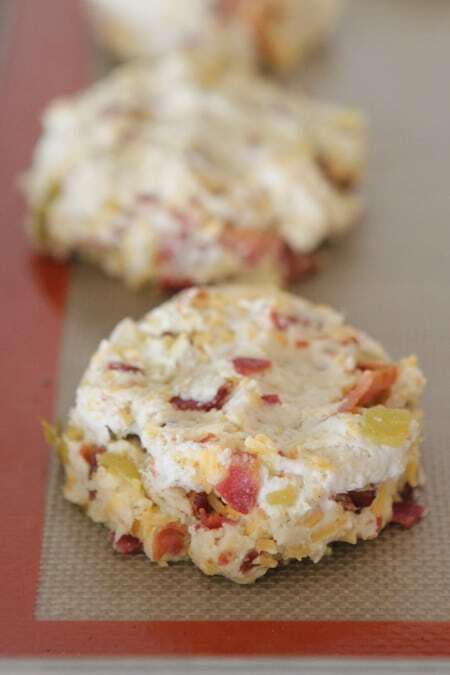 They are loaded with cheddar cheese, diced green chiles and BACON! Talk about my dream biscuit. These babies are best eaten warm with a nice spread of butter. Let’s take a look at how to make these biscuits. Here’s an idea of the ingredients you’ll be using. See recipe below for all of the details. 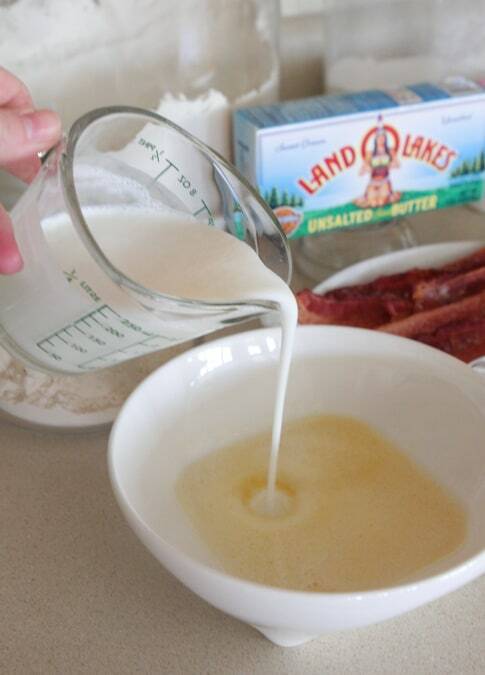 Start by whisking buttermilk into melted butter. Set aside for just a moment. 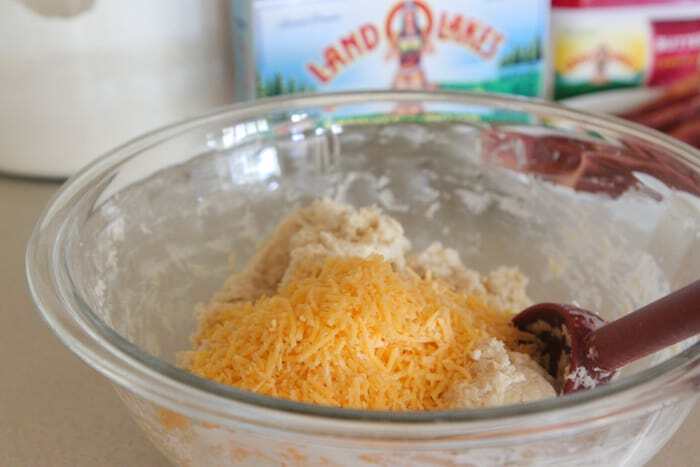 Next, you’ll add your flour to a large mixing bowl. Add the baking soda, salt and garlic salt next. 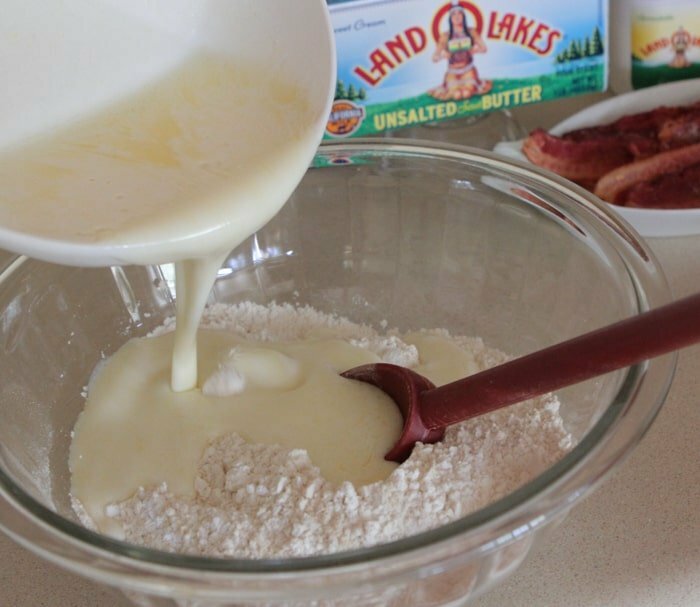 Gently fold in the buttermilk/butter mixture to your dry ingredients. 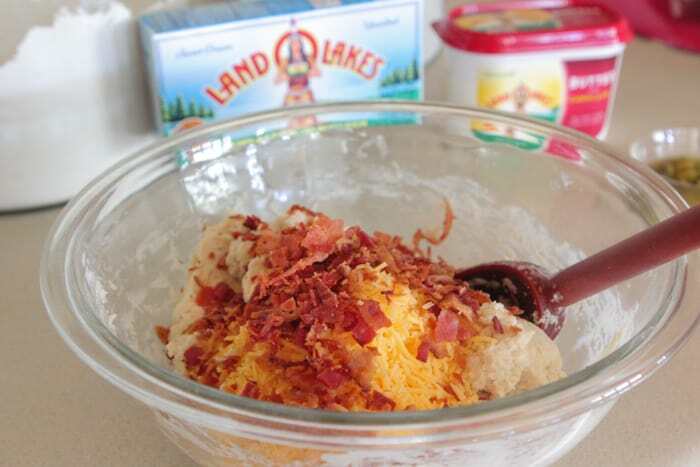 Your crumbled bacon goes in next. Last but not least some diced green chiles. Give it one last gentle mix and get ready to transfer to your baking sheet. I used a large ice cream scoop to place the dough onto my baking sheet. It’s equal to about 1/3 cup. Anything works, even a spoon. I pressed each little mound of dough flat like this and shaped into a thick round. Time to bake! 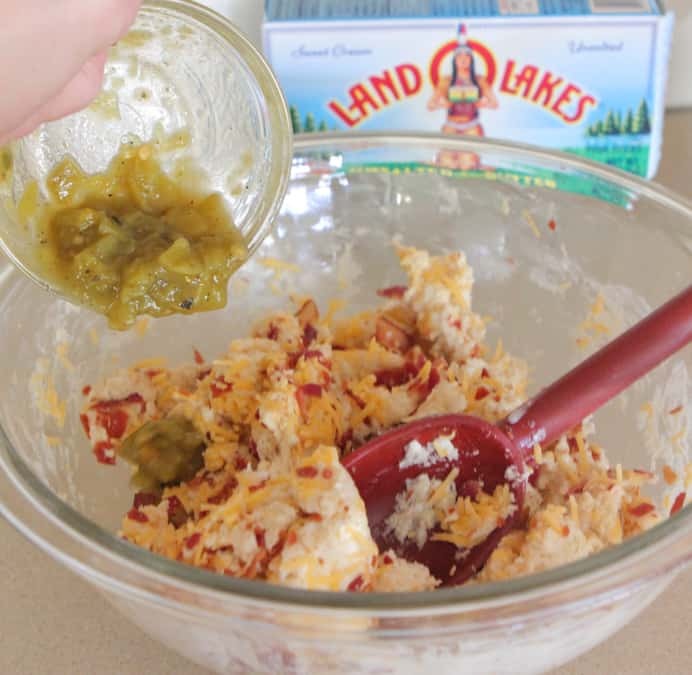 I mixed some Land O Lakes® Spreadable Butter with Canola Oil and some of the diced green chiles for spreading onto biscuits…..so good! While the biscuits are still hot, brush some of the green chile butter over tops. I love how quick to prepare these biscuits are. Only about 10 minutes of prep time and they are in the oven. Can’t beat that! 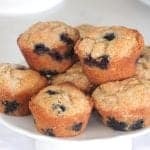 They are great for breakfast, tempting for lunch and a must for dinner. Be sure to split open and try the green chile butter inside. 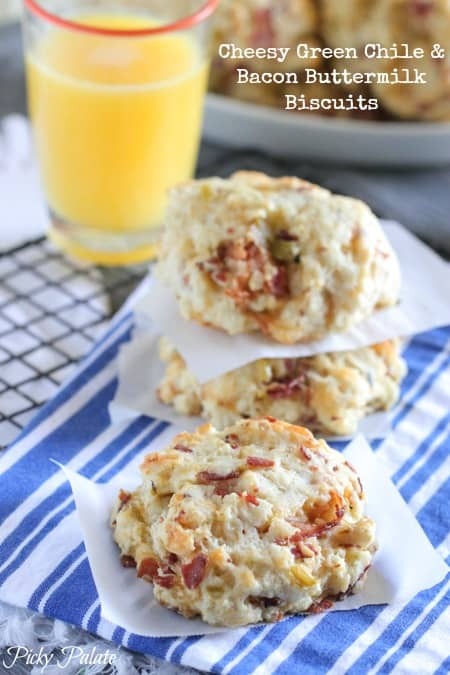 Enjoy my Cheesy Green Chili and Bacon Buttermilk Biscuits! Preheat oven to 450 degrees F. and line a baking sheet with a silpat liner or parchment paper. Place butter in a medium heat proof mixing bowl and microwave until melted, about 60 seconds. Slowly whisk in buttermilk to combine. 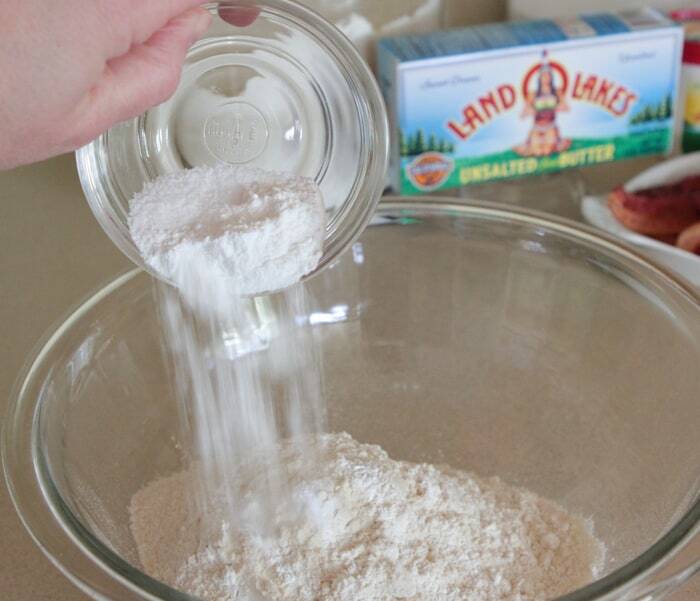 Place flour, baking powder, salt and garlic salt into a large mixing bowl. Stir to combine then slowly fold in butter/buttermilk until just combined. 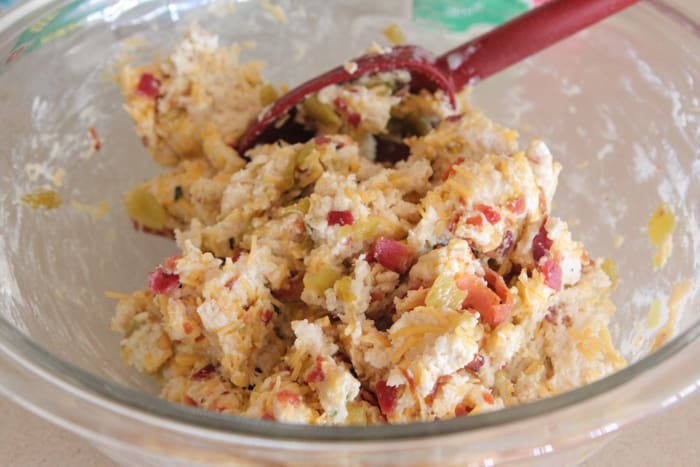 Fold in cheese, bacon pieces and green chiles to combine as well. 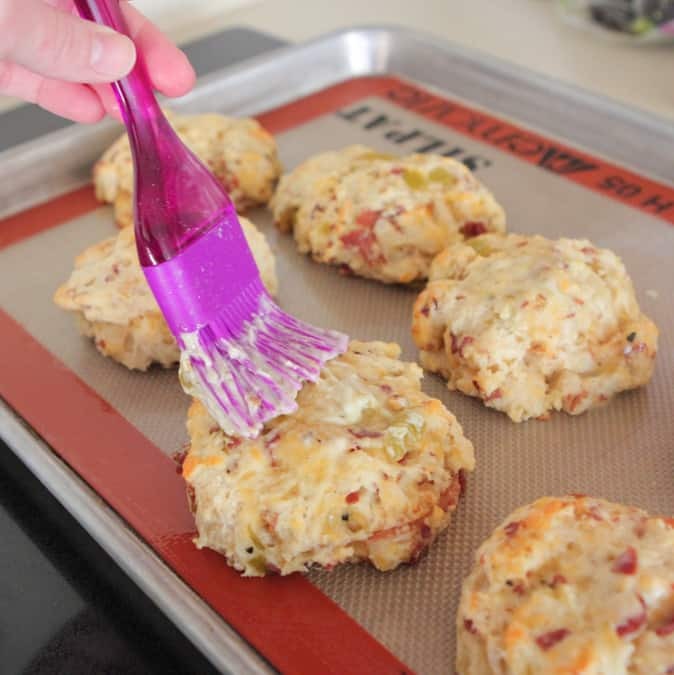 With a large cookie scoop or 1/3 measuring cup, place biscuit dough onto your prepared baking sheet at least 1 inch apart. Bake for 10-12 minutes until puffed and cooked through. Remove and let cool for 5 minutes before handling. 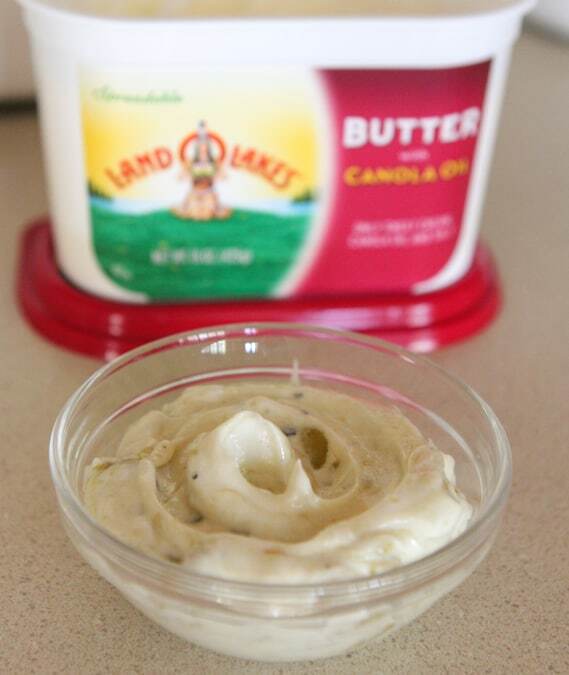 Place Land O Lakes Spreadable Butter with Canola Oil and green chiles into a medium mixing bowl. Stir until well combined then use for spreading on insides of warm split rolls. 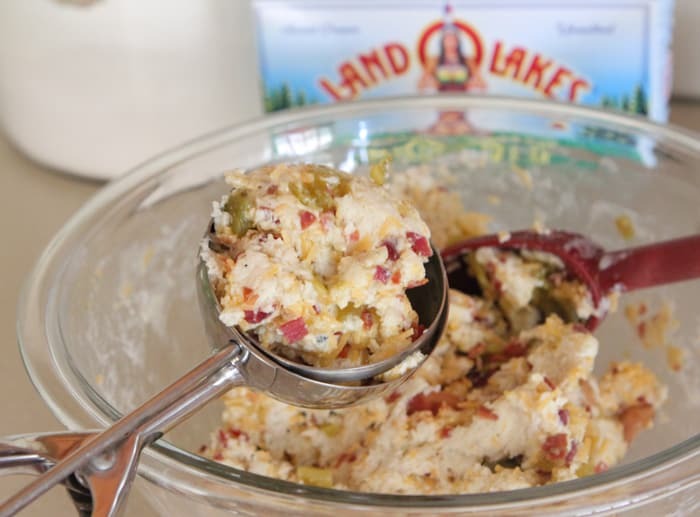 Disclosure: Picky Palate has partnered with Land O Lakes for an exclusive endorsement of Land O Lakes® Butter for their Kitchen Conversation blogger program 2014. This blog post was sponsored by Land O Lakes. 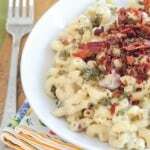 I just love when I come across a recipe that looks great and I have all the ingredients in my pantry and fridge! Win-win for me! These biscuits were so wonderful, Jenny!!! Glad to get to see you last week and can’t wait to do it again in June!! Jenny, I really cannot wait to make these at home. They are SO good!!! Loved hanging out with you at the ranch!!! Hope you’re having a fabulous spring break! These look so good! My family would go crazy for them! I am dying at how fantastic these look!!! oh my gosh I can’t wait to make these!! OMG- I want to stuff my face full these!!! 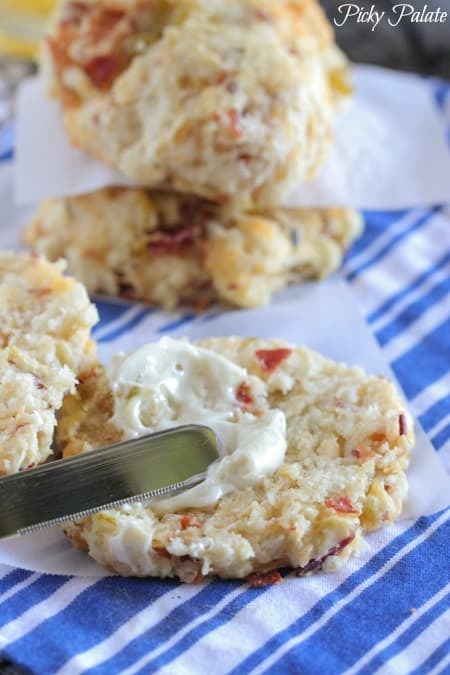 Omg I love how much bacon and cheese is going on in these biscuits!! Jenny- these look like the best thing ever!! 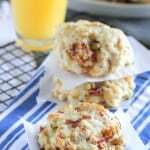 LOVE these savory biscuits Jenny! Oh Jenny! These sound os good right now. Wish I had a basket full. This could possibly be one of my all-time favourite combinations of food! Love it! These biscuits sound so good! I could make a meal out of just these biscuits! Anything with green chile and bacon gets my vote. The addition of butter is just a plus in my book! 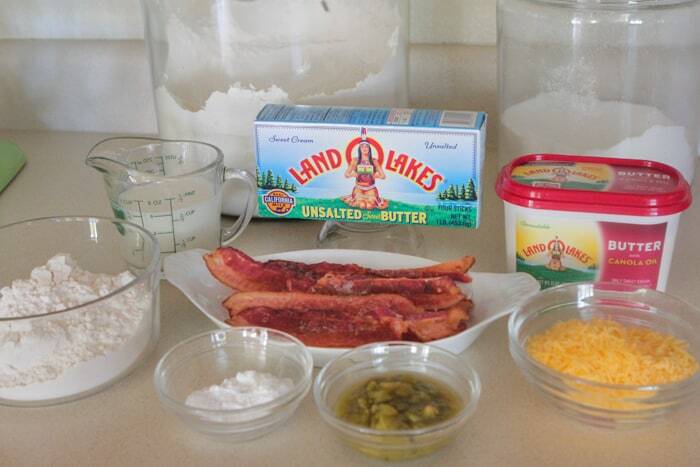 Nothing better than a buttermilk biscuit..but then you add cheese AND bacon….. 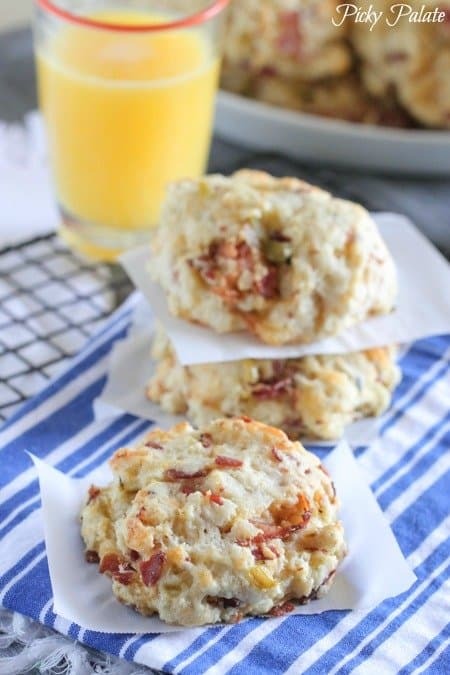 I love savory and cheesy biscuits! I can only imagine how amazing they taste the kick of green chili! Perfect to go with chili! Thanks for sharing! 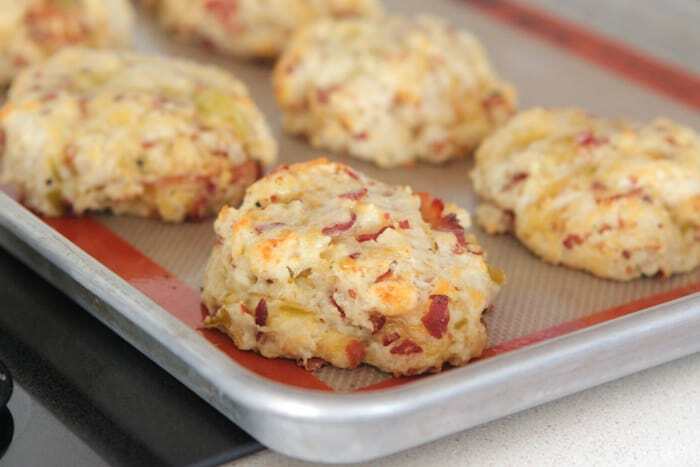 I LOVE green chile anything, so these were totally my dream biscuit with the bacon and cheddar too. It was great to spend time with you at the ranch and I’ll see you in MN! Love!! These little babies look like they pack quite the punch. Thanks Emily 🙂 These are my new go to biscuits! These are biscuits on steroids… genius lady! These biscuits make perfect snack too! I love to have savory biscuits as a snack! I would like to make them my self because These biscuits make perfect snack.